Show your team pride by carrying your college colors to game day festivities and everywhere you go! Great for tailgates, beach, pool, farmer’s market, grocery shopping, travel, gifts and much more! Spirit This versatile carry-all tote is lightweight with an open design so you can throw in anything that fits! The stand-up structure provides for easy loading and unloading. It is the fashionable choice as a reusable grocery bag for the supermarket or farmer’s market. 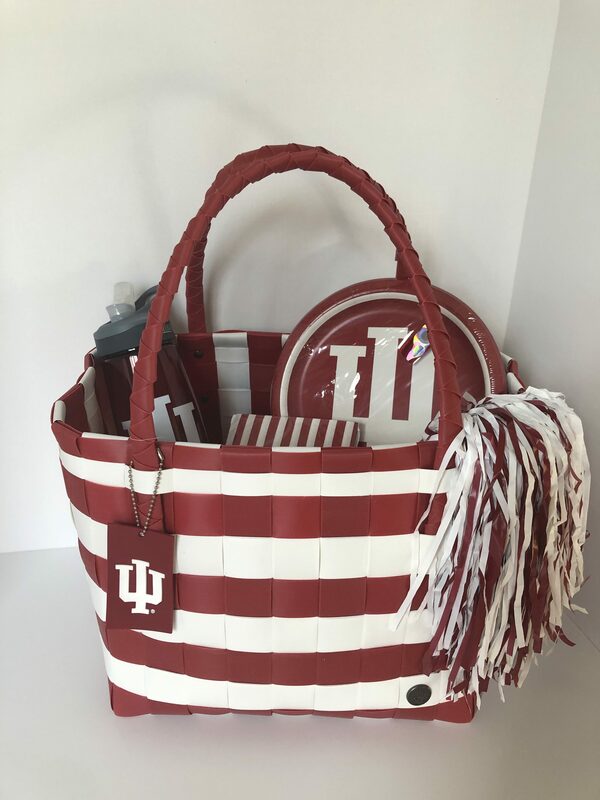 Perfect for the tailgating, beach or swim club, craft night, travel, school or work. Cleans easily with the swipe of a cloth. Handmade of 70% recycled durable polyethylene. Everything we put our hands to is manufactured ethically and is guaranteed 100% free of child labor. Shoppers: All our shoppers are being woven with Polyethylene (PE) straps. 70% of the Polyethylene is from recycled industrial waste. 30% new PE is needed to get color in the strap material. The PE comes as granules at our partner in China. There, it is heated and through extrusion, rolled up and ready to use.